Editor’s note: This is a version of an article that appeared in the University of Chicago news. 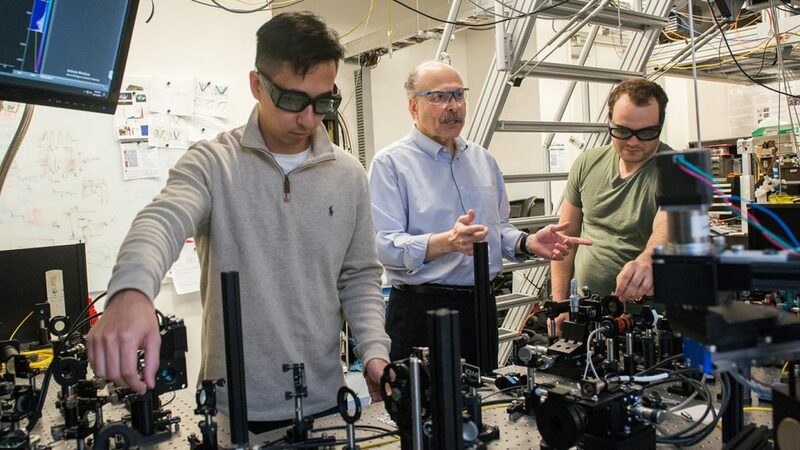 The University of Chicago’s David Awschalom (center) conducts research with his students on an unhackable network that uses the laws of quantum physics to ‘teleport’ information. The University of Illinois at Urbana-Champaign is joining forces with the University of Chicago and Illinois’s two national laboratories, Argonne National Laboratory and Fermi National Accelerator Laboratory, to make the Chicago area a national leader in quantum technology—a rapidly emerging field with revolutionary potential and growing backing from government and industry. The initiative is a major step in an expanded series of collaborations between UChicago and the University of Illinois at Urbana-Champaign, deepening their connections in the Discovery Partners Institute and the Illinois Innovation Network. The universities will be announcing a range of joint projects, including research partnerships in such areas as materials and computing, as well as civic engagement collaborations that will benefit Chicago’s South Side, the Urbana-Champaign community and the state. The civic engagement collaboration will focus on youth entrepreneurship, business diversity, K-12 education and urban labs research. The quantum collaboration, bringing together the intellectual talent, research capabilities and engineering power of the University of Illinois at Urbana-Champaign, the University of Chicago, Argonne and Fermilab, is based in the Hyde Park 53rd Street innovation district, which is anchored by the Polsky Center for Entrepreneurship and Innovation. The University of Chicago provides management oversight for Argonne and Fermilab. The combined resources of the four institutions create a powerful hub of more than 100 scientists and engineers—among the world’s largest collaborative teams for quantum research. A number of breakthroughs in recent years have taken quantum from science fiction to real-world applications, touching off a global race to develop technologies that could dramatically improve computing, communications, cybersecurity and sensing. Possible applications range from unraveling the structure of single molecules to speeding up searches for new pharmaceuticals to improving earthquake monitoring to protecting military and financial information. The federal government is increasingly interested in quantum technologies. Legislation that unanimously passed the U.S. House of Representatives in September would launch a National Quantum Initiative, committing $1.275 billion to quantum research over the next decade. Also in September the White House held a summit on quantum science with research and industry leaders. The University of Illinois at Urbana-Champaign is joining as a core member of the Chicago Quantum Exchange, which was launched last year by the University of Chicago, Argonne and Fermilab to promote quantum research. The new alliance already has multiple projects under way, including one of the world’s longest quantum communication links to test technology that one day could be the basis for an unhackable network. It will stretch 30 miles between Argonne in Lemont and Fermilab in Batavia. The effort uniquely positions the Chicago area to attract industry partnerships and government funding while making it a leader in training the new quantum workforce. On Nov. 8-9, government officials, university researchers and industry leaders — including senior researchers from Google, IBM and Microsoft — will gather in Chicago for a two-day summit on quantum science and technology. “Harnessing the laws of quantum mechanics holds great promise for a wide range of technologies. The Chicago Quantum Exchange brings research universities and national laboratories together in an innovative way, making Chicago a unique and powerful hub for the development of critical new technologies,” said Robert J. Zimmer, president of the University of Chicago. The collaboration between UChicago and the University of Illinois at Urbana-Champaign is based in the new 53rd Street innovation facility developed by Wexford Science and Technology, where the Polsky Center supports venture creation at the university and with community entrepreneurs. The universities’ developing research and public engagement efforts will leverage their research and programmatic strengths in diverse areas, ranging from improving educational outcomes to supporting entrepreneurs and small businesses. On Oct. 29, the University of Illinois at Urbana-Champaign announced a new investment of $15 million to establish the Illinois Quantum Information Science and Technology Center (IQUIST) at the Urbana-Champaign campus, adding dramatic capacity to the quantum collaboration. The Chicago Quantum Exchange’s capabilities span the range of quantum information — from basic solid-state experimental and theoretical physics, to device design and fabrication, to algorithm and software development. The four members each bring unique capabilities, talents and resources to the partnership. UChicago’s Institute for Molecular Engineering boasts one of the nation’s leading programs in quantum engineering, and faculty across IME and the Physical Sciences Division at UChicago hold deep expertise in quantum physics, computing, communications and sensing. The University of Illinois at Urbana-Champaign is one of the few institutions in the nation with large, top-ranked research programs and world-class faculty in all of the disciplinary areas central to quantum information sciences. UIUC faculty have been pioneers in laying the foundations for this field — from the theory of superconductivity to the development of nanoscale quantum devices such as the first visible semiconductor lasers. Argonne’s quantum research includes discoveries of new materials and devices for solid-state qubits — the quantum computer version of a bit. The national lab has expansive experimental and computational infrastructure. Fermilab scientists, together with academic and tech industry partners, are applying their world-leading expertise in superconducting accelerator technology to applications that include using quantum sensors for scientific discovery and developing quantum algorithms and simulations for higher-energy physics problems. “Our abilities to create and control quantum states of matter at the level of single atoms, electrons and photons is leading to fundamentally new technologies for computation, communication and sensing. Bringing the University of Illinois at Urbana-Champaign’s world-class science and engineering faculty to the Chicago Quantum Exchange creates one of the largest quantum research efforts in the country and will dramatically accelerate scientific developments that can lead toward high-impact applications,” said David Awschalom, director of the Chicago Quantum Exchange, UChicago’s Liew Family Professor in Molecular Engineering and an Argonne senior scientist. The University of Chicago manages Argonne for the U.S. Department of Energy through UChicago Argonne, LLC. The university manages Fermilab together with the Universities Research Association, Inc. through the Fermi Research Alliance.